If you have not attended VMworld Barcelona, you can just put your email on this page, and you'll be able to watch. (I also embedded the page little bit down the post so you can register there as well). 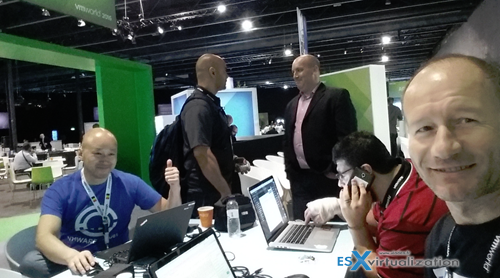 VMworld Barcelona is a must be an event in Europe. The event drives large audience. VMworld Barcelona 2016 uncovered VMware vSphere 6.5, VSAN 6.5, but also, more importantly (for some) the new VMware cloud strategy, which now seems to be rock solid. VMware and Amazon AWS finally stop competing (or trying to) against each other, but rather cooperate to offer VMware customers, I hate to say, “single pane of glass” management UI for private and public cloud. Zerto Virtual Replication 5.0 – What's New? We have seen a VMware Cross-Cloud. Migrate, secure, manage between vSphere, Azure, Google and AWS. Just impressive !! The General Session Keynotes will be available live via webcast at the VMworld homepage on Monday Aug. 29, 2016 at 9 a.m. PDT and Tuesday, August 30, 2016 at 9 a.m. PDT: https://www.vmworld.com/en/us/index.html. 70 new Hands-on Labs — new NSX, Horizon, AirWatch, Virtual SAN, Arkin and Tech Preview vSphere Labs and Challenge Labs.